After attending Sasquan, the World Science Fiction Society convention in Spokane, Washington, we took a trip 75 miles south to Pullman, Washington, home of Washington State University. Along the way we admired the huge rolling hills of the Palouse region, and such natural wonders as Steptoe Butte (named for a US Army officer who lost a battle to the Palouse tribe) and Kamiak Butte (named after Chief Kamiakin, a Yakima and Palouse leader that faced off against the US Army). Due to extremely heavy smoke from forest fires in British Columbia, Idaho and Washington, we couldn’t see any of the natural wonders. It was mostly an imaginary admiration. A few days later, we drove from Pullman to Bremerton, Washington. Pullman is next to the Idaho border, and Bremerton is 350 miles away. Decades earlier, before roads were widened, straightened, added, bridged, etc., the trip was almost 400 miles, one way, with most of that trip through — nothing. The navigator for the journey was not familiar with the route, but given an iPad and Google Maps, she was prepared for the intricate navigational challenges. First step, drive north from Pullman 14 miles to Colefax, WA, then turn left on Washington 26 for 137 miles to Vantage, Washington, on the banks of the Columbia River. Between Colefax and Vantage, there is — nothing. Animated GIF (created by Google Photos) of several still photos taken between Colefax, Washington and Washtucna, Washington. During this first leg of 151 miles, from Pullman to Vantage, we saw fewer than a dozen vehicles on the road. That includes passing through Colefax, the seat of Whitman County. We did see the occasional farm building, power line, or highway sign, but even those were few and far, far between. 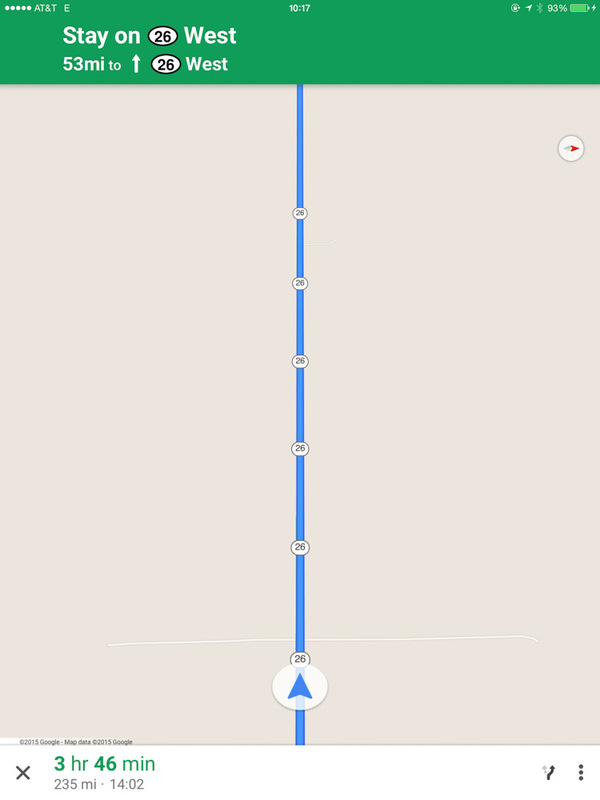 A screen shot of Google Maps reveals nothing, which is revealing. Washington Highway 26, heading west, as shown on an iPad. Note the helpful directions at the top, advising you to stay on 26 West for 53 miles until you reach 26 West. After about an hour, as we crested one hill only to see miles of more of the same, the navigator started giggling. Several minutes later, at the crest of the next hill (these are big hills, and even at 65 mph it takes a while to get from one crest to the next), she burst out laughing. We stopped in Washtucna, mostly because we’d never stopped in Washtucna in perhaps a hundred trips down this highway. We saw one person at the combination gas station, convenience store, museum, and thrift shop. Between the yellow-tinged sky (due to smoke) and the miles and miles of little more than sagebrush and tumbleweeds, the mind is starved for green. Due to the severe drought, even the small rivers and irrigation ditches were dry, and everything was brown. Eventually we came to the broad, blue waters of the Columbia River. 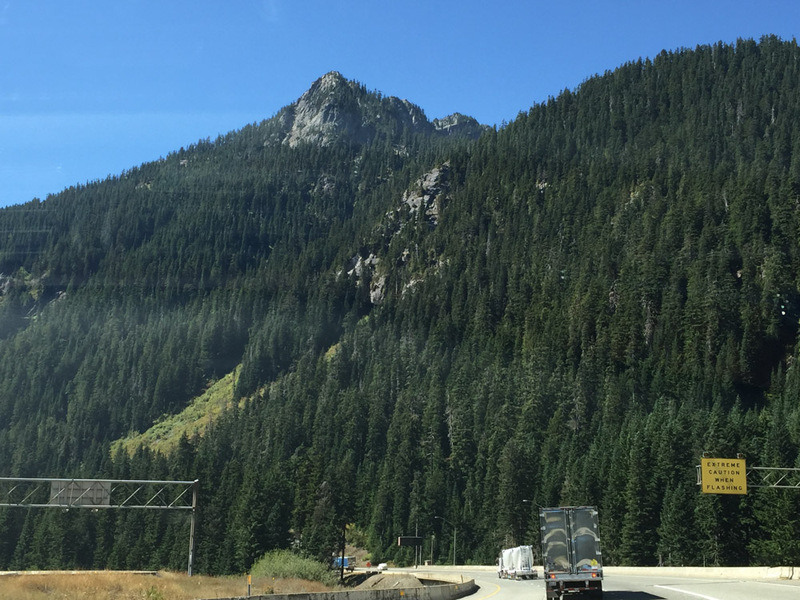 A couple of hours later, we crested the Cascade Mountains at Snoqualmie Pass, and dove into western Washington’s riot of evergreens. Even in the middle of a spectacular drought, western Washington fairly glowed with green. Traffic picks up on Interstate 90 as we head into the green expanse of western Washington. It is 234 miles from Pullman to Snoqualmie Summit. For those interested in seeing more photos of the Empty Quarter, we’ve created a photo catalogue of the Pullman to Snoqualmie trip. And if you wondered, yes, I do love eastern Washington. The vast emptiness has a stark beauty, and intense grandeur. Though green is in short supply. We allegedly live in an age of plenty. Is that limited edition toy sold out? The manufacturer will make more. Grocery store out of your favorite brand of yogurt? Wait a day, or if you are impatient, go to another store. True, the air is getting dirtier, our oceans are full of garbage, and much of the country is in a drought, or suffering from long-term effects of polluted surface water and underground water. But aside from shortages of air and water, limits are things that humans overcome; we’re quite good at it, when we devote the effort. As a guess, this means that I single-handedly filled all of Apple’s iCloud storage service with just my photos, videos and whatever else I was saving in iCloud Drive. And apparently I can solve Apple’s storage problems by simply pushing the blue link at the bottom. There I was, thousands of miles from home, with the air full of smoke, surrounded by very polite people (not really; at the time, I was a couple hundred miles from the nearest city, in a very empty part of the world). And, if I’m reading the language correctly, I had managed, on my own, to completely fill Apple’s iCloud storage service with my photos, videos, and whatever else I was putting in iCloud Drive (cumulus? cirriform? cirrus? cirrocumulus? cirrostratus?). Fortunately, I could apparently solve Apple’s iCloud crowding by simply pushing the link at the bottom. 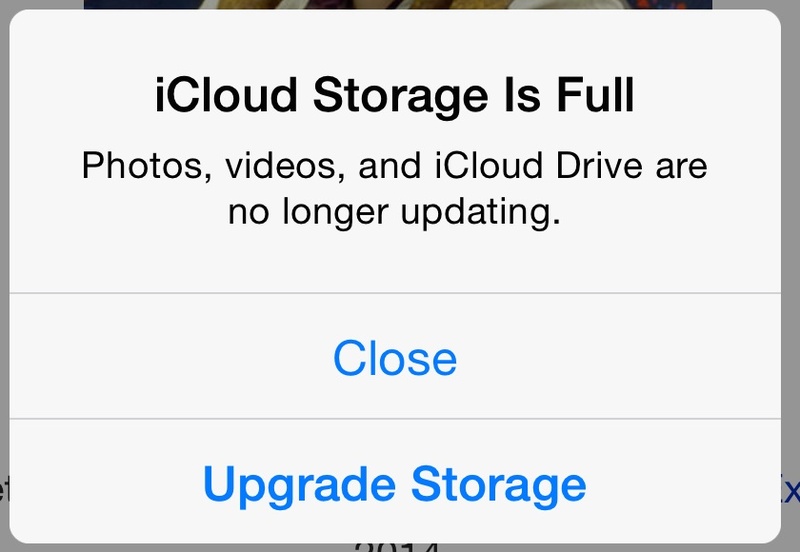 I could upgrade storage, eliminating Apple’s congestion. Exactly why I would want to move Apple’s storage uphill was not immediately clear; weren’t clouds pretty much uphill already? Or possibly this was an indirect reference to Sisyphus, forever pushing a stone up a grade. Then I thought: an upgrade traditionally means more work. When your car encounters an upgrade, the engine must work harder, and you burn more gasoline. If you are walking or biking up an upgrade, you tire more quickly, and may give thought to turning around and finding a nice chair to sit on. Why would I want to make storage more difficult? Ultimately, I did not press the link. To be honest, with all the forest fires in the area, the sky was saturated with smoke. It is entirely possible the clouds were not full, but simply blocked from my view. I will think on this; I’m not a meteorologist.